Looking back, August was a month of progress with a hint of change. We made progress toward our winter preparations and full-time living. 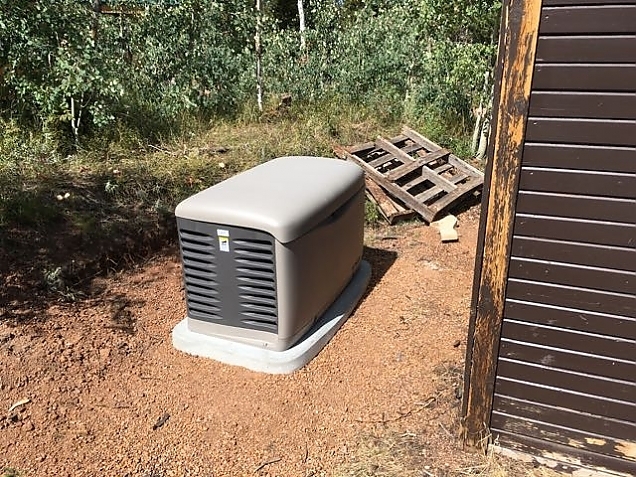 The propane generator was delivered (although it still needs to be connected to a yet-to-be-delivered propane tank, and wired into the house). 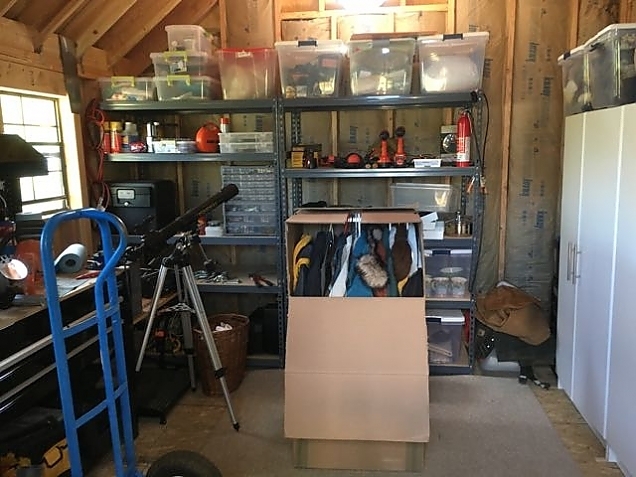 I've been working on insulating the shed, and I put up shelves so it can be a place to store supplies such as canned food, dog and cat food, extra dry ingredients like flour, rice, beans, etc. I got some UHT milk and cream out there already. And, we bought a Sam's Club membership (the closest is in Cheyenne, Wyoming) and we'll stock up before winter. We will have a propane fridge out there along with the freezer. We bought the freezer a week or so ago. You may question the wisdom of an electric freezer in an off-the-grid cabin. But, my logic goes something like this: once the freezer is cold and filled with frozen goods, it probably won't run much. The hotter the ambient temperature, the more it will run. But, the hottest ambient temperatures are in the summer when we also have the most sun to provide power. 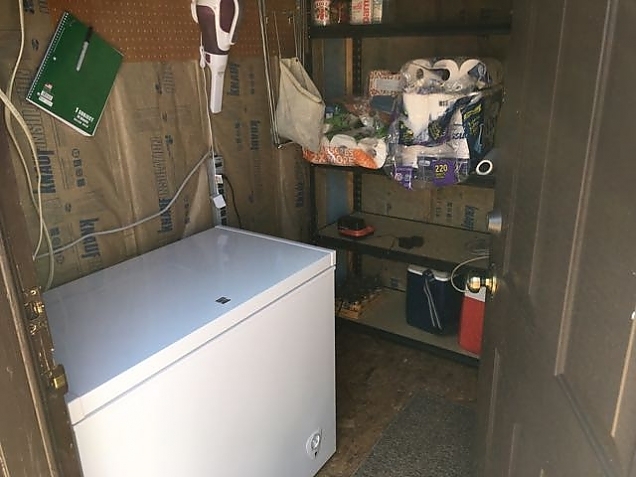 In winter, the shed will likely be quite cool (even after insulating it), and the freezer won't run as much. We'll see. Turns out, propane appliances are very expensive while the electric versions are much more affordable. Experimenting with an electric alternative may save us a lot of money. Storage in the barn is in good shape too. I've installed some shelves (with more hand-built shelves to come) along with some clothes wardrobes. We now have a place to put seasonal clothing. I've decided I have way too many clothes. So, some additional organizing and pruning needs to be done. I wear jeans, a t-shirt, and a long-sleeved shirt pretty much every day. I try to wear old worn out and stained jeans when doing "dirty" chores, then change into a nice pair for just hanging out around the cabin. A t-shirt is sufficient when it is sunny and especially if I'm doing any work. A long-sleeved shirt may be needed if the sun gets to be to much on my delicate skin, or if it gets a bit chilly. I'm sure I look like a hillbilly when I go into town because I don't dress "special" for that trip. Turns out, now that we have a washing machine, I could probably live with 4 pair of jeans, 4 to 6 t-shirts, and similar number of long-sleeved shirts and a week's worth of underwear. I also need one or two pair of nice slacks, a couple of dressy shirts and a sports jacket--not sure why, but I think I need these things. What I don't need is the two or three wardrobe boxes of Hawaiian shirts, dress pants, short-sleeved shirts, and other sundry clothing that I will likely never wear. We will need to switch out summer shirts for flannel in winter. And, find a place to put sweaters and coats. The wildlife is both leaving and coming. The hummingbirds are about gone. They come around Mother's Day and are gone around Labor Day. Where we used to have maybe 50, we now have 3 or 4. It is sad to see them go. (See the hummingbird video below!) But, the shorter days and cooler weather mean other animals are on the move. Wildlife that seems to go away for summer is back. We are seeing more moose and deer, even a few elk already. Coyotes howl and bark at night. The Great Horned Owls make their variety of calls almost every evening. We are seeing lots of hawks and eagles on our drive into town and back (along with many antelope). Hunting seasons start soon and somehow the animals know the schedule, so they will disappear again soon for a while. Did you see the game camera shot of the mountain lion from a few weeks ago? We've had vehicle problems this month and will go way over budget for truck maintenance. If you've been reading the blog for a while, you know about the fuel system problems we had with the Suburban (whom we call Big Red). I got a new fuel pump and fuel filter installed this month. I got the pump off Amazon at about $150 less than the dealership wanted to charge me. (Thanks to my GM parts guru sister!) And, we got a flat on the front-right tire on the Expedition (named Lex). I was able to swap it out for the spare (no small job with 22" tires! ), and we took it into town. Of course, the nail in the tire was too close to the sidewall to repair. And, the tires needed to be changed anyway. The nice fancy "Jersey highway" tires just didn't hold up well on dirt and gravel. So, Lex is getting 4 new tires and a brake job. Ouch. The Beaver Creek fire is still burning, and will burn until we get some snow. And, while we've had one or two hazy, smoky days, it is not as bad as it was earlier in the year. Other fires are burning in the area, but none close and none are a threat to us. Fire restrictions are still in place preventing us from using our outdoor fire pit. We are making progress on wood gathering, but are behind by about a cord, I think. I had hoped for one cord per week in August and September giving us roughly 8 cords. I think we have 2-1/2 put up with another 1/2 cord ready to section and split. We've been going into the meadow to get wood rather than using the ample pile we have close to the cabin (saving that for when the snow flies), and that is time and effort consuming. Lynne did a nice post on this recently. I'm getting proficient at sharpening the chain saws! Destin is growing. And, learning. And, taking advantage of his cuteness. He now weighs around 60 pounds at 5 months of age. His adult teeth are coming in and his "fro" hairdo is receding. We'll be taking Destin to a puppy class dog show in Greeley, Colorado on 9 September. That should be a hoot. The weather is turning. It is getting colder at night. This morning when we got up it was 34°. We just had a short rain/hail storm as I write this and I built a fire in the wood stove to cut the chill. We are struggling to find someone to come up and install a replacement entry arch with a gate and some fencing to replace what has fallen down over the past few years. It is always so hard to get work done up here. With our storage issues most solved, we have turned our attention to gather wood and getting the backup propane generator installed. With those two things done, we will be mostly ready for winter with only a few remaining preparatory chores such as getting the snow blower tuned up and getting tracks and a blade on the Ranger. And, I need to build a wood shed to shelter several cords of wood. I have a place for it, but can't start until the propane tank is delivered. That happens on 8 September, so I'll start the wood shed soon after. I have not done this kind of construction before, but have drawn out a plan that I think will work. It will be a simple lean-to style wood shed, 8' x 12'. It will be educational, I'm sure. We are getting to know Laramie better. What a great little town! We've found a butcher that we love. We'll be getting bulk meat from them to put in our new freezer for winter. We have also discovered some great second-hand and antique stores, good restaurants and bars, and many other local small businesses that we can't wait to visit. And, college is back in session. So, lazy Laramie is now buzzing with activity. As nice as Laramie is, we are making way too many trips into town. I hope that ends soon and we can go a week at a time without a trip. Another big chore confronts us this week: getting Colorado drivers' licenses and registering Big Red. We'll fill you in later. Previous entry: Round ‘Em Up!